The Rio Grande River runs through western Albuquerque and has a plethora of flat bike paths and running trails to enjoy. 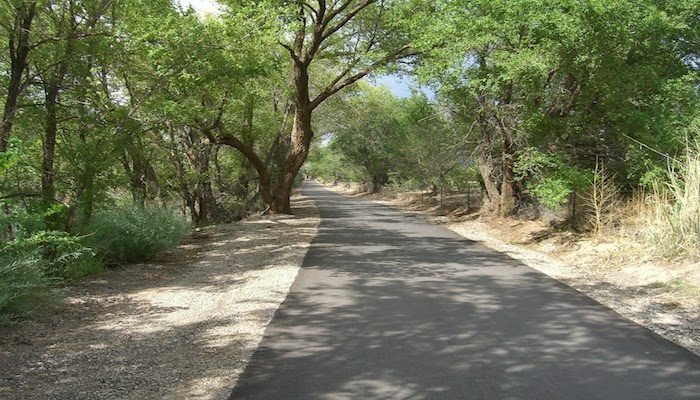 Stretching from the South Valley to just north of Los Ranchos De Albuquerque, the Paseo del Bosque Trail is paved for 16 miles with a side dirt trail extending an additional five miles. If pacing out a long run or tempo workout, the paved path provides quarter miler makers to help track distance. The trail is most developed on the east side of the river, especially as you head north. Highlights along the trail include the Rio Grande Nature Center the Albuquerque BioPark and the National Hispanic Cultural Center. The trail itself has 7 access points along the paved path length. 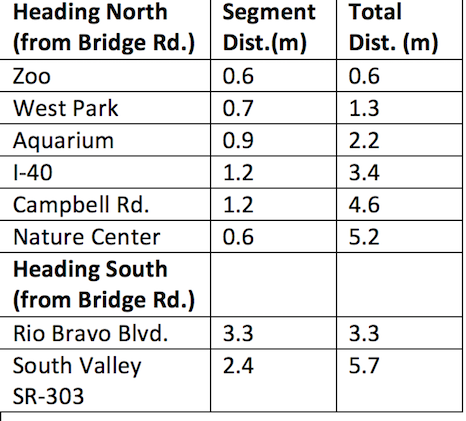 Some key distances, from National Hispanic Cultural Center (Bridge Rd. ), along eastern side. A great place for easy parking, access to the river trails and a post-run museum tour is the Albuquerque’s National Hispanic Cultural Center, right near downtown. From the parking lot, head west towards the bridge hovering over the Rio Grande on Bridge Boulevard. Before heading to the other side follow the bike path beneath the bridge and to the right. On the other side of the bridge you will find yourself with the option of a beautiful soft dirt trail or a bike path. In picking your path, the dirt trail will provide less pounding on the joints, yet the bike path will take you a half mile up past the Albuquerque Zoo where you’ll see the smiling faces of children riding on the small locomotive taking kids from one exhibit to another. Keep an eye out for cyclists as they ride long, fast and hard along the Rio Grande trails that extend nearly all the way to Santa Fe. The aromas of South Valley farmers growing and roasting green chile in the neighborhood may cause great hunger!